This was a fairly short first effort to reach one of the pinnacles that makes up Kalalea Mountain on the NE side of the island of Kauai. I found no information online regarding possible routes in the Forest Reserve area, so I decided to drive out there with about three or four free hours to see what I could find. The closest road is Hokualele Rd off the main Highway 56 just north of Anahola. Unfortunately it appears almost all the land on either side of the road to its end is private property. I found a short side road leading to a water tank that I parked at. This gave me access to the mountain from the east side, climbing up steep hillsides through brushy forests for about a quarter of a mile. After about half an hour I had run out of easy and not so easy terrain, and was faced with nearly impossible bramble and forest to get through. 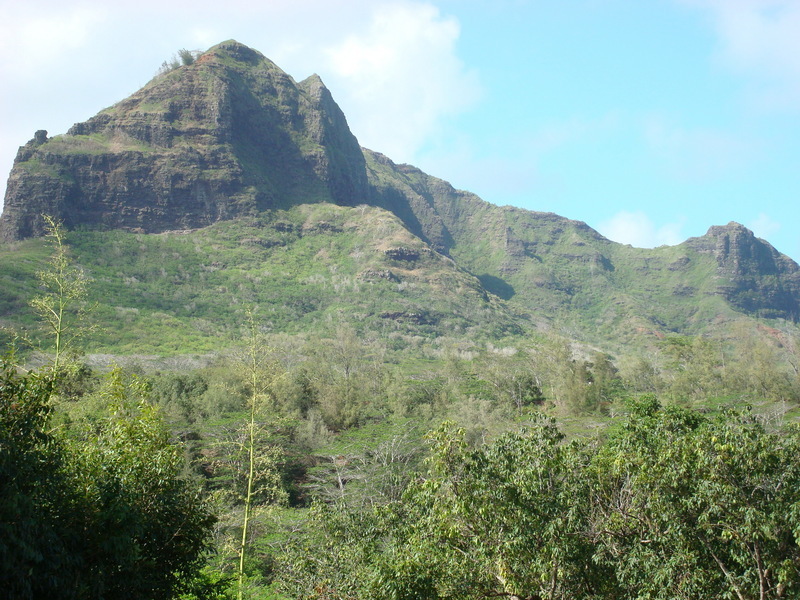 This side provided access to Hokualele, but the ring of cliffs surrounding it on this side appeared impregnable, and trying to force my way through the woods seemed like it would only lead to frustration at the base of the cliffs. So I turned back. My next approach will either be from the northeast or possibly from the southwest after crossing the Anahola River. It certainly seems like quite a challenge getting to this formation, despite its apparent closeness to roads and civilization.